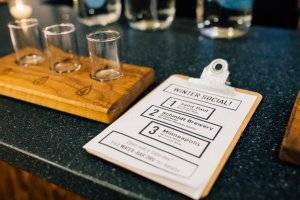 Northeast Minneapolis, perched alongside the Mississippi River, has long been known for its brewing scene. Its residents are no stranger to a bar. So a pair of local artists — Shanai Matteson and Colin Kloecker — took that format and flipped it on its head. Instead of serving up local brews at their space, they serve up local tap water from cities across the state. Yep, just water. Why? While the craft beer boom got people interested in where their beer comes from, most still have no idea how their tap water got to their faucet. And the source of that water — the Mississippi River, in the case of Minneapolis and St. Paul — is the reason the craft beer industry can exist at all. 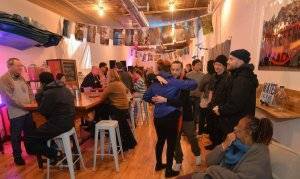 People gather at Water Bar’s annual Winter Social. Credit: Sean Smuda. Heck, it’s the reason Minneapolis and St. Paul can sustain entire cities. Their business, Water Bar, is a social enterprise with a goal to change the culture. What can water really mean? It started as a series of “pop-up” water bars serving up flights of the stuff, including an annual appearance at the Minnesota State Fair staffed by water advocates and even employees from the Minnesota Department of Health. But with its more permanent space, it hopes to serve as a social space for people to gather around change. The way Matteson sees it, that usually means passing the microphone. Water Bar is made up of a community of artists that teaches people what water means to them. One is Amoke Kubat, who works to empower mothers and families in Minneapolis as as a Yoruba priestess, teacher, artist and writer and through her own cooperative, Yo Mama’s House. Kubat hosts her own version of the water bar, Yo Mama’s Watering (W)hole, which she uses to involve mothers, especially women of color and women who are low-income, in water issues. It serves water using the Dakota language, which is considered endangered. Matteson said thinking about water also means confronting issues of race and class. The lake had been previously referred to as “Lake Calhoun,” after white secessionist John Caldwell Calhoun. Looking at water issues as a whole can be overwhelming. Globally, 1 in 9 people don’t have access to safe water. The 2014 water crisis in Flint, Michigan, where the tap water was contaminated with lead after public officials failed to protect against corrosion, raised awareness that water pollution can happen in the United States. Residents were, up until April 2018, forced to drink bottled water. There have also been concerns about lead pollution in Milwaukee, Wisconsin, and Pittsburgh, Pennsylvania, as well as of radium contamination in Grady, Texas. Some argue Minnesota is also at risk of major tap water quality problems. Water Bar’s approach to water issues is unique. It puts the scientists working to solve these issues together with artists and activists with the same mission. That can make water activism more approachable, and also less siloed. Because while science can answer the yes or no questions, many water issues are more complex than that. “Those are ethical questions or spiritual questions or questions that have to do with feelings and our emotional lives. Because climate change and water issues are really scary,” Matteson said. One of the ways Matteson grapples with it is knowing that she can’t do everything to fix tap water issues, but that she can help impact change where she lives. A typical menu at Water Bar. Credit: Water Bar. She’s seen evidence of that. For example, Minnesota Department of Health employees have frequently served as Water Bar bartenders. Because of that, the state health department now sets up a Water Bar each year at the Minnesota State Capitol, as part of a presentation to the legislature to make a case for drinking water protection. Knowing that Water Bar has played a hand in how people communicate at the state government level is a big deal, she said.